Nurse appt day 2 for dressing change and review of home program. Ice/elevation every 2 hours for 15 minute to minimize edema and promote healing (please refer to Icing - Recommendations handout). Avoid impact or twisting for 4 weeks. Soft tissue treatment to quads, posterior musculature, suprapatellar pouch, popliteal fossa, iliotibial band and Hoffa’s fat pad. No direct scar mobilization (Avoid direct palpation and mobilization on incisions/portals for 4 weeks). Strength training specifics: quad sets/straight leg raises, hip abduction, calf presses/heel raises, Gluteus sets, and core conditioning. Upper body conditioning, well-leg stationary cycling or Upper Body Ergometer (arm bike). Gait training progression towards minimizing assistive devices (walker, crutches, etc). Range of motion 0 to 90 degrees. Pain < 3/10, minimal Edema. Gait weight-bearing as tolerated; Good quality gait with least amount of assistive device. Nurse appt for suture removal day 14. Walking for 15 -20 mins daily. Avoid impact and twisting of the knee for 4 weeks. No direct scar mobilization on incisions/portals for 4 weeks. Functional strengthening exercises including squats/leg Press, bridges/hamstring curls, 2” step Down. Intense core training, aerobic exercises as tolerated (bilateral stationary bike, Elliptical, arm bike). Active Range Of Motion: equal extension to uninvolved side and flexion to 120 degrees. No edema. Full weight-bearing; normal gait without assistive device. Single Leg Balance 60 sec on level surface. MD appt at 4 weeks. Walk up to 1 hour for exercise. Apply direct scar tissue mobilization; can use instruments/tools. Emphasize self stretching to both lower extremities. Increase intensity of resistance exercises (i.e. standing resisted squats, lunges, etc). Introduce lateral and eccentric exercises (4-6” steps). Introduce controlled pivoting and twisting of lower extremity. Initiate impact training with water or trampoline. 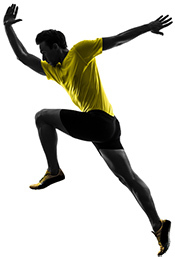 Greater emphasis on single leg strength, increase challenge of proprioceptive training. Bike with minimal resistance, Elliptical, Swimming-flutter kick all tolerated. Progress back to sport training.